WILLIAM MONAGUE NATIVE ART - william monague native art Inspired by Mother Earth and the Spirit World, William Monague shares his unique artistic expression and Anishnabek Culture by providing the "Spirit of Color" to any home or business. 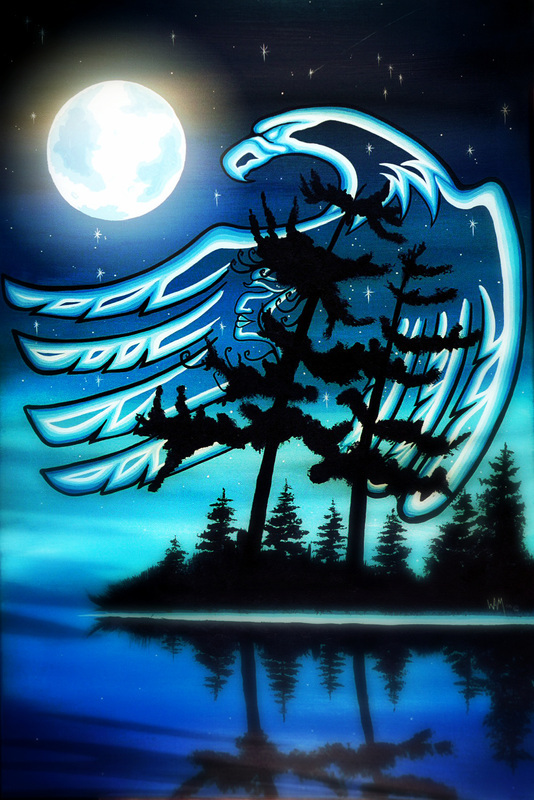 "Abwaudung" The Visionary or Dreamer"
William grew up on Christian Island, Georgian Bay home of the Beausoleil First Nation People and currently resides in Midland, Ontario. The self taught artist left his Beausoliel First Nation reserve on Christian Island in the 70's and 80's travelling the Pow Wow circuit to sell native art. Soon after his three daughters Wausa, Wabie and Awasis were born. On the Pow Wow trail original paintings, carvings and quill work were acquired by curators seeking native art. The Washington Museum of Fine Art, Turtle Art Gallery in New York, Royal Ontario Museum and Whetung's Art Gallery among others. 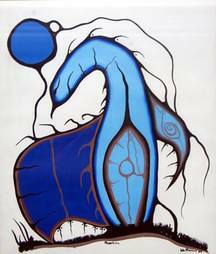 During the Alberta and British Columbia shows in the 1980's William was awarded Most Unique Native Artist. The Artist travelled extensively selling arts and crafts while subsisting with the family in his 1979 GMC Vandura. This was essential in the early establishment of Monague Native Crafts Ltd. The family operated business he assisted in establishing has since become one of Canada's leading global producers and suppliers of native products. From humble beginnings years ago to present day William maintains the same dedication creating and authenticating his artwork and skill. His works have been commissioned and acquired all over the world. During the spring of 1998 his son William Aries was born and the artistic endeavor of "Snowy and the Otter" commenced. Canada Council for the Arts, Aboriginal Peoples Exchange Program recognized and supported this artist endeavour. The Ojibwa artist and his Metis wife Brenda travelled to Inuit communities Rankin Inlet and Iqaluit, Nunavut researching Inuit culture to ensure authenticity of the story. The project is ongoing and a life long quest for the artist and his wife. The adventures of "Snowy and the Otter" will offer young and old, a fun and memorable journey into the diminishing legends, language and culture of the Inuit and Ojibwa. William has received many awards and recognition throughout his career including a Lifetime Achievment Award in 2008 and a Seven Grandfathers Award for Humility in 2012. In the fall of 2015 he was commissioned by the Martyr's Shrine to create artwork to adorn the Holy Door in honor of this Jubilee Year of Mercy called upon by Pope Francis. The first Holy Door to open was St. Peter's Basilica at the Vatican; the final one opened at the Martyrs' Shrine in Midland May of 2016 and will be sealed permanently at a ceremony that will take place at the end of the season. His creation in 2016 "Our Lady of Mercy" welcomes pilgrims from all over the world and is rich is symbolism relevant to both the Roman Catholic Church and Indigenous Peoples.